The Boilers opened the game doing a good job of handling the Texas Tech pressure, hitting five of their first six shots and opening an early lead. The Purdue defense in general was solid early, forcing the Red Raiders (27-9) into a lot of tough jump shots, while Vincent Edwards got to the basket frequently and scored six points in the opening minutes. When he spun in a layup with 13:45 left in the first half, the Boilers led 15-8. Then the Boilers' offense fell apart. Over the next 7:46, they missed six straight shots and turned the ball over five times. Two of those turnovers were from Matt Haarms, who struggled to handle the Red Raiders' pressure in the opening half. Purdue didn't score a single point in that nearly eight-minute stretch and Texas Tech ripped off a 7-0 run to even the score. It would have been more, but TTU also missed seven straight attempts and went scoreless for over six minutes. Purdue (30-7) re-built its lead thanks to a pair of 3s from guard P.J. 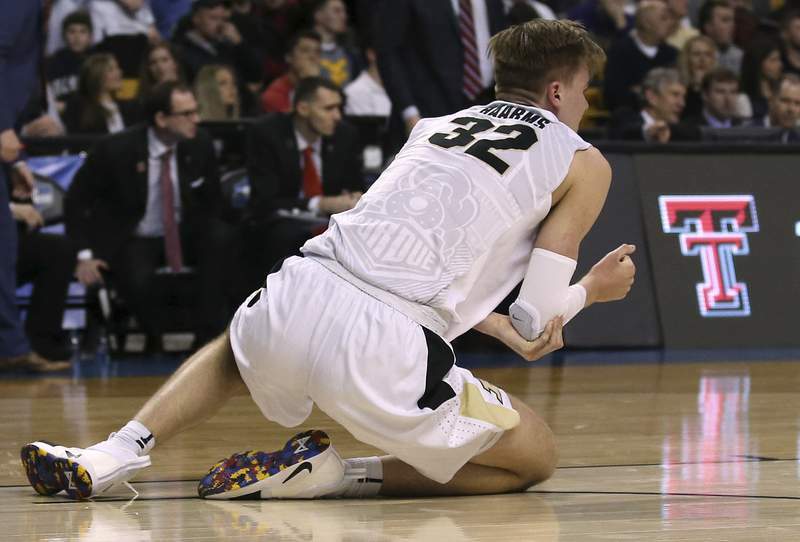 Thompson, giving him seven in the tournament, but the Boilers were unable to get anything sustained going to the hoop after Edwards' flurry of early drives. Most troublingly, they didn't shoot a single free throw in the opening half, a sign that Tech's pressure on the perimeter was taking a toll. That was even more evident in Purdue's nine turnovers, several of which were passes to nowhere that went out of bounds. 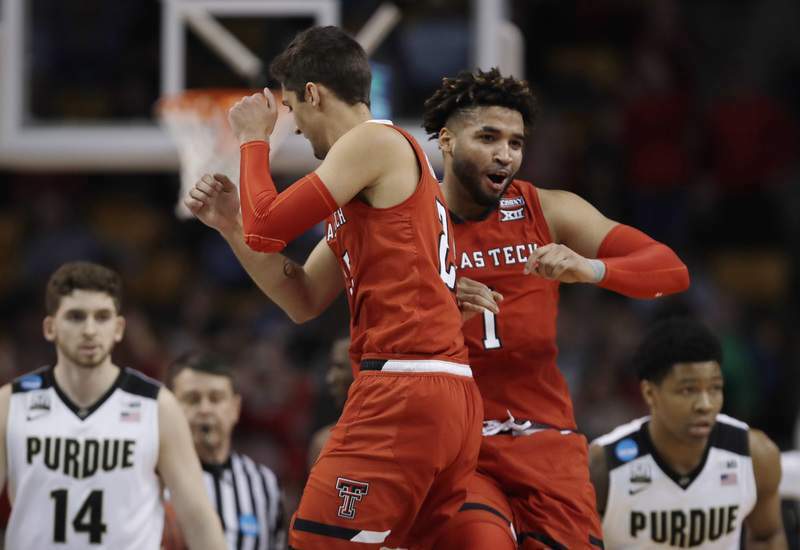 A crucial run came late in the first half, when the Red Raiders embarked on a 10-0 run, turning to a 25-20 deficit into a 30-25 lead. 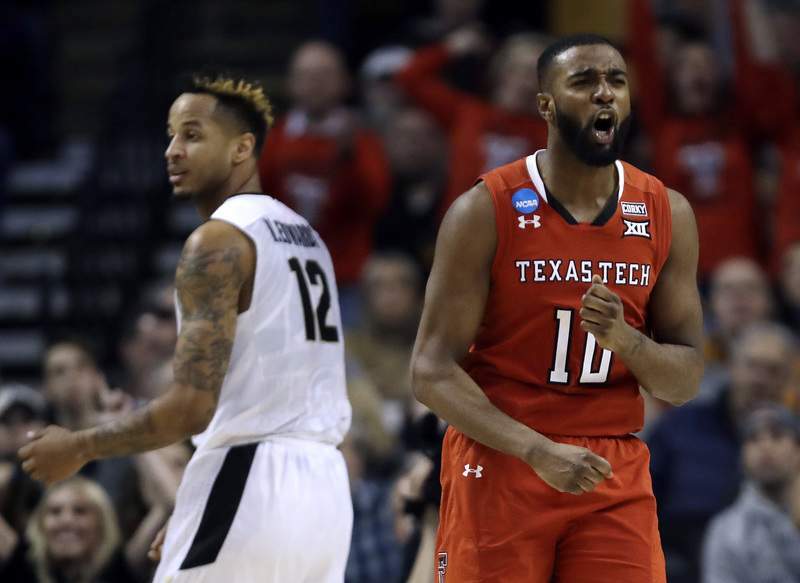 Texas Tech made its last six shots of the half, while Purdue missed its final four and turned the ball over three times in the last four minutes of the half. TTU led at halftime despite star guard Keenan Evans taking just two shots and scoring only four points. The beginning of the second half brought more of the same for the Boilermakers. They tried to attack the basket, but Tech's defense was good enough to mostly keep them away from the rim and the Red Raiders got several put-back baskets because Purdue didn't box out on the weak side. Purdue remained close thanks to a couple of long 3s from Carsen Edwards, but offense was nearly non-existent inside and the Boilers trailed 50-41 with 11:05 left. The Purdue sophomore continued his excellent play as the half wore on and Purdue chipped away at its deficit. He scored seven points in a row during one stretch and the Boilermakers sliced the lead to just three at 56-53 with six minutes to play. He was the only one really attacking the rim for Purdue, but it was enough to keep the game within reach. The Red Raiders really put the game away with about four minutes to play. They used a 7-0 run to stretch their lead back to 12 and secure their place in the Elite Eight. Keenan Evans hit a huge 3 to halt some Purdue momentum, while the Boilermakers turned the ball over twice. In the end, Purdue just couldn't hold on to the ball when it really needed to. 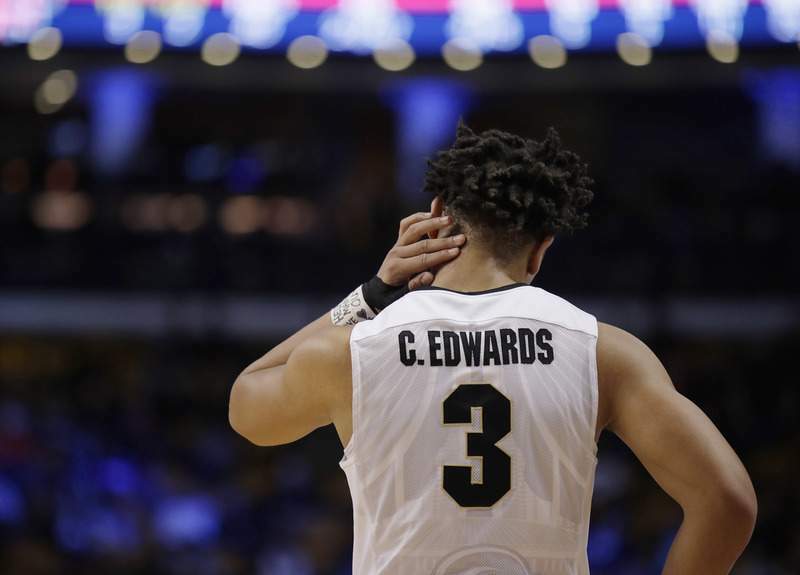 Even in a losing effort, Edwards was magnificent in the second half, keeping the Boilermakers in the game when it looked like Texas Tech might pull away. He finished with a game-high 30 points, including 25 in the second half, on 11 for 20 from the field. He made four 3-pointers and posted his first 20-point effort since the Big Ten Tournament semifinals against Penn State. Purdue loses its fourth straight game in the Sweet 16. 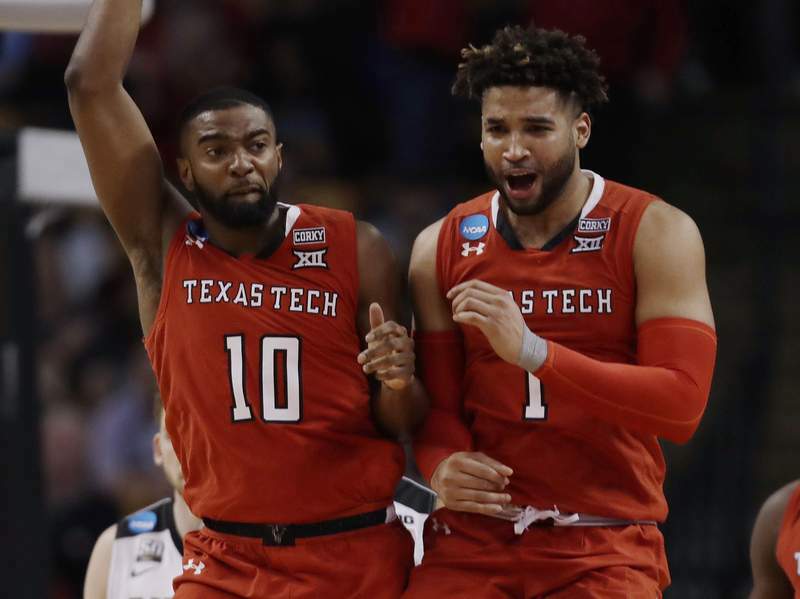 ... Texas Tech reaches its first Elite Eight in team history. ... Purdue's senior class ends its career with 104 wins, the second-most in team history. ... Vincent Edwards scored 12 points, putting him over 500 for the season and making it the first time in Boilermaker history that three players reached that mark in the same year (Carsen Edwards and Isaac Haas have also scored 500). ... Texas Tech came in forcing 15 turnovers per game, and the Boilermakers gave the ball away 17 times, leading to 15 Red Raider points. Purdue had just two points off TOs ... Texas Tech grabbed 11 offensive rebounds and turned it into 17 second-chance points. ... Keenan Evans led Texas Tech with 16 points.